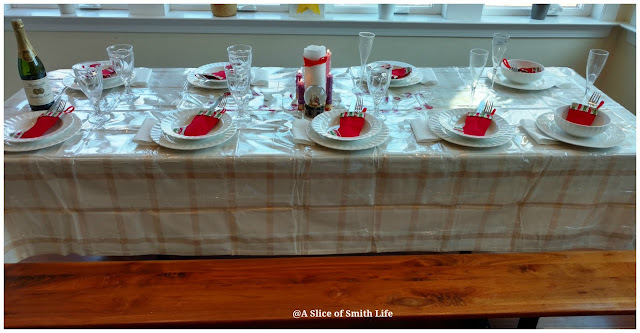 A Slice of Smith Life: Christmas 2016 Highlights! 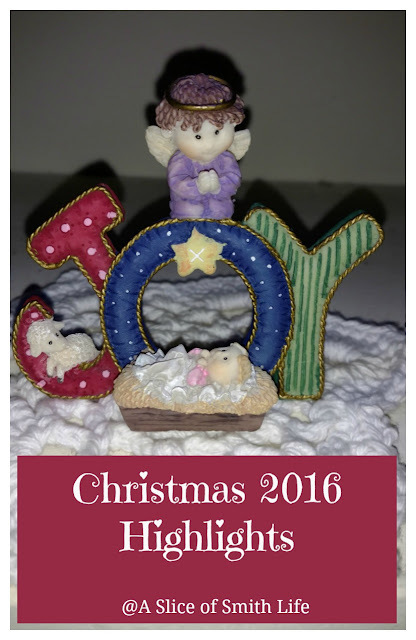 Before I share some of our Christmas 2016 highlights you might be interested in reading a post I wrote a few years ago about why celebrating Christmas as a season makes sense. I wrote this post after hearing and seeing how many people think Christmas is during Advent and then on Christmas Day, it's over and done with, but in reality Christmas Day is the first of the 12 days of Christmas! Also, on this fourth day of Christmas, the Feast of the Holy Innocents and Martyrs, we remember the Ten Types of Holy Innocents Today. Such a sad post, but an important one as a reminder to continue to pray for all of God's children, unborn and born. Just before Christmas, each of my children added one hand print to our "Handy Tree Skirt". We have been doing this tradition since 2008. 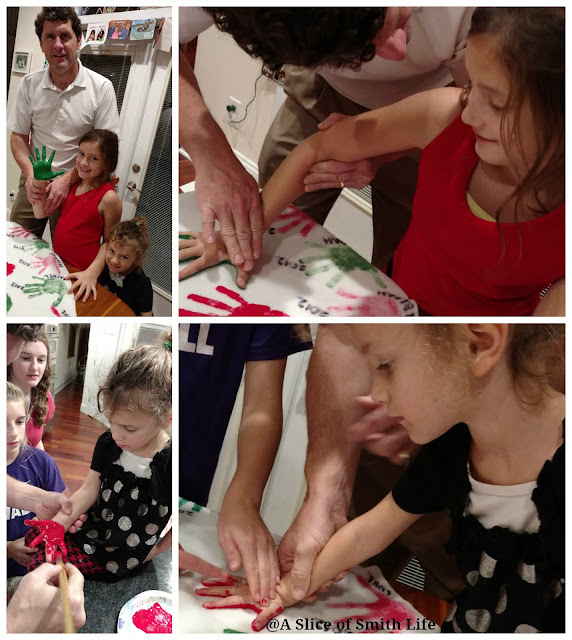 We use the same white felt tree skirt year after year and after we paint each child's hand and lay it (carefully) on the skirt, I write the child's name and year next to their print. So each year we add 5 red and green hand prints to our skirt. 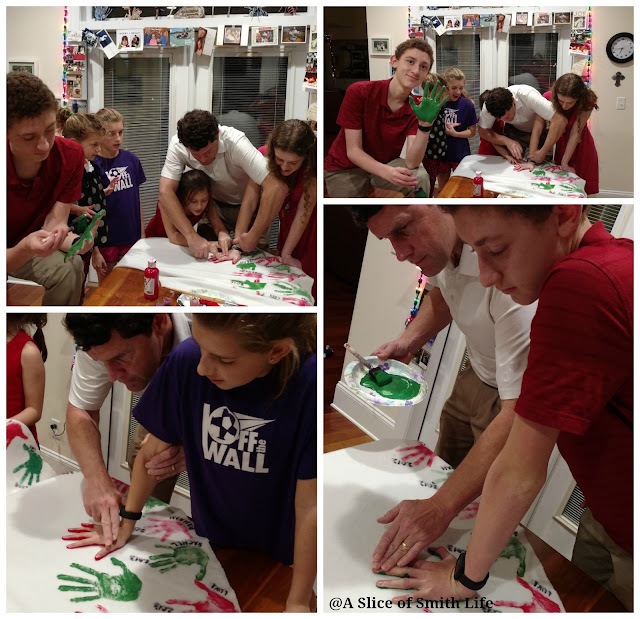 My children look forward to this simple and fun tradition each year! 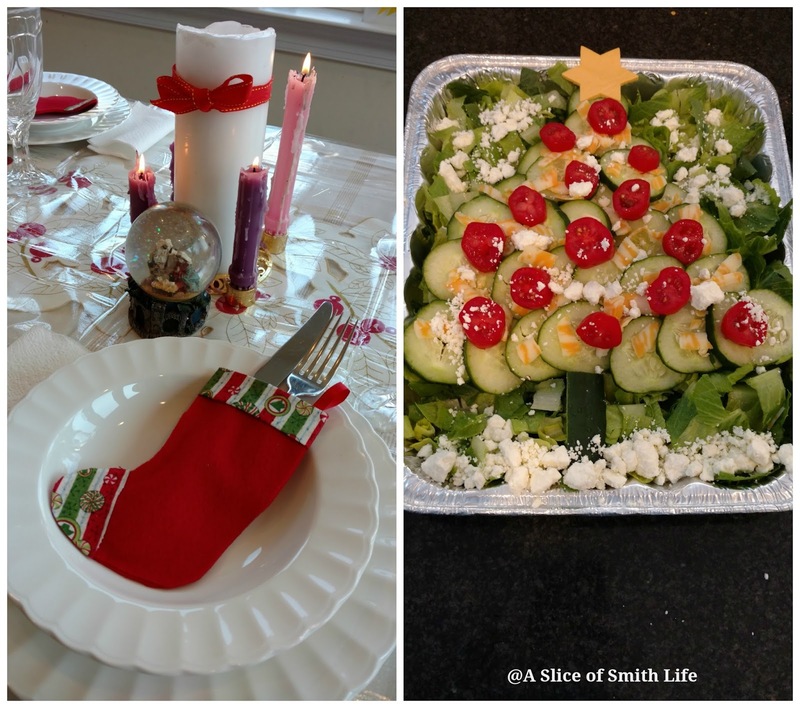 Our family was busy in the kitchen making several plates of Christmas treats for friends and family the week before Christmas Day. 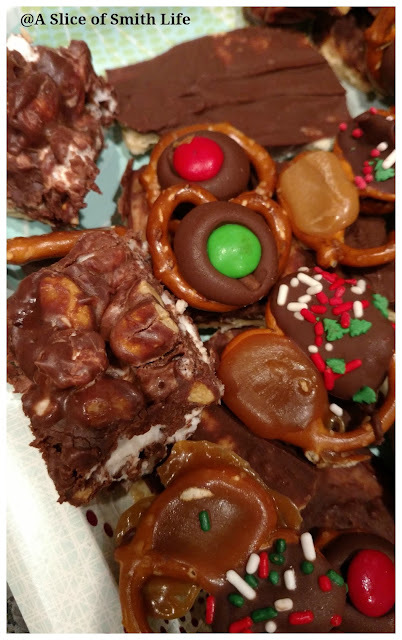 We made our traditional Bua Bark and Pretzel Treats which we have made for many, many years. This year we also made Rocky Road Fudge and the new sweet treat that were added to each plate were these delicious Chocolate Carmel Pretzel Bites! Oh My! They are as good as they sound! And here is a plate with all 4 treats included.... Bua Bark, Pretzel Treats, Rocky Road Fudge, and Chocolate Carmel Pretzel Bites. My 3 year old daughter put glue in hers and then dropped beads and sequins in the ball and some foil paper. My 9 year old daughter glued a "R" on her ball with purple and white beads because her name begins with "R" and then she cut up various colors of shiny paper and stuffed it in the ball. My 12 year old daughter cut out the squishy white stuff out of a pull up diaper, wet it and then put it in her ornament. She found this idea on Pinterest! Then she painted a snowman face on the outside. This makes for a very cute and heavy ornament! My 15 year old son went outside and found soil, leaves and Christmas tree needles and made a "mini-terrarium"as he calls it. My 16 year old daughter glued various sequins on the outside of hers. Also pictured above in the photo is the plastic jar ornament I made my 4 year old niece. 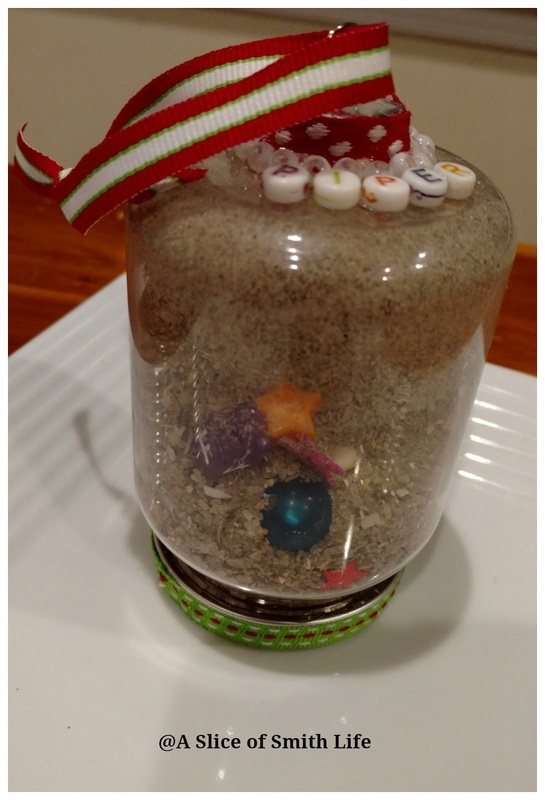 I gathered sand from our local beach since she lives many miles away from us and doesn't get to visit our beaches a lot then I added small trinkets (beads, rubberband, shells, marble....) in the sand so it became a "Seek-n-Find" ornament. When I mailed her the ornament I wrote out a list of things she could find in her ornament. I used a jar so that she could display it all year on its lid side. Once again we attended the 4:00 PM Christmas Eve Mass since 2 of my daughters sang in the children's/teen choir and my oldest daughter played one song using bells with other friends. It was beautiful! Our son was an altar server at Mass. Our church sounded and looked festive and beautiful! Late Christmas Eve brought very bold colds and fevers for both my husband and myself. (I'm sure staying up to 3 AM wrapping gifts and playing Santa and waking up at 6:45AM by our children didn't help with sickness!) So Christmas Day and the day after Christmas were long for both of us, but filled with many blessings! All our children enjoyed their gifts and were grateful for them. After gifts were opened my parents came over for an Italian lunch. On the menu was my grandmother's homemade sauce and then meatballs, sausage and raviolis. On Christmas night, my 3 year old decorated Jesus' birthday cake with sprinkles and I took a couple of photos of her before my husband and I had to leave my in-laws Christmas gathering with our 3 year old because we weren't feeling well at all. 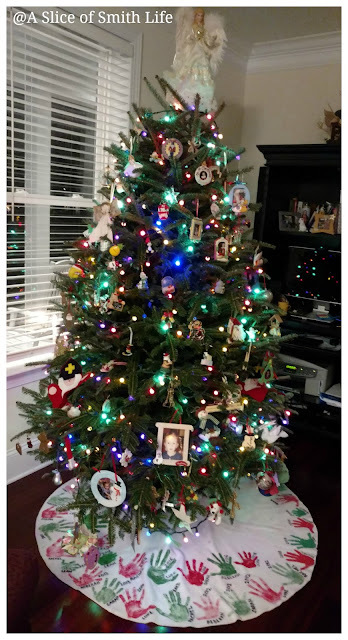 My 4 older children stayed at my in-laws to hang out with the cousins and were brought back to our house later that night. 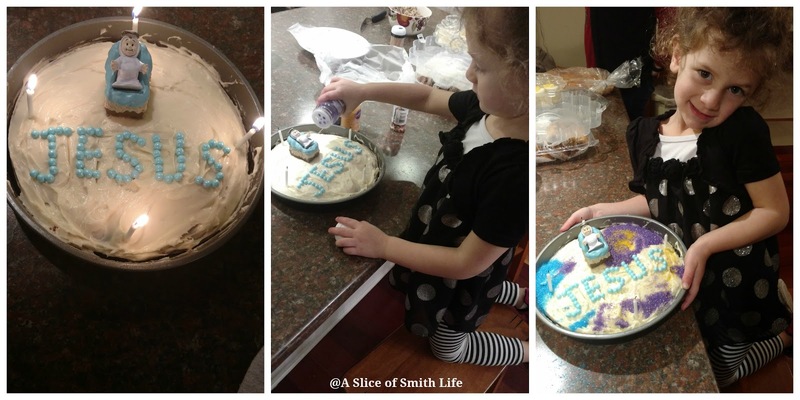 This year we celebrated Jesus' birthday with a cake and a pie! Since we weren't able to sing for Baby Jesus as a family on Christmas night due to my husband and myself being sick we waited to celebrate together the day after Christmas, on the second day of Christmas, and sang "Happy Birthday" to Jesus with the Butterscotch Cinnamon Pie my 9 year old daughter and I made! 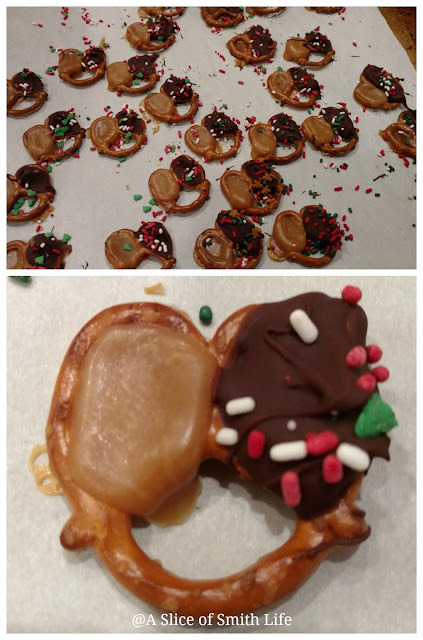 My daughter got the recipe from Nerdy Nummies, a YouTube channel she watches often and is inspired by. It was another blessed Christmas spending time with family and friends! 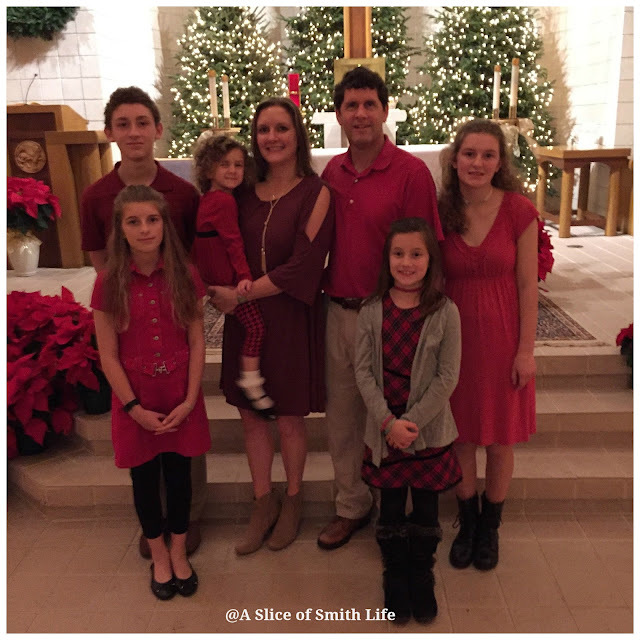 I am so grateful for our faith, family, health and being able to embrace the true meaning of the Christmas season! 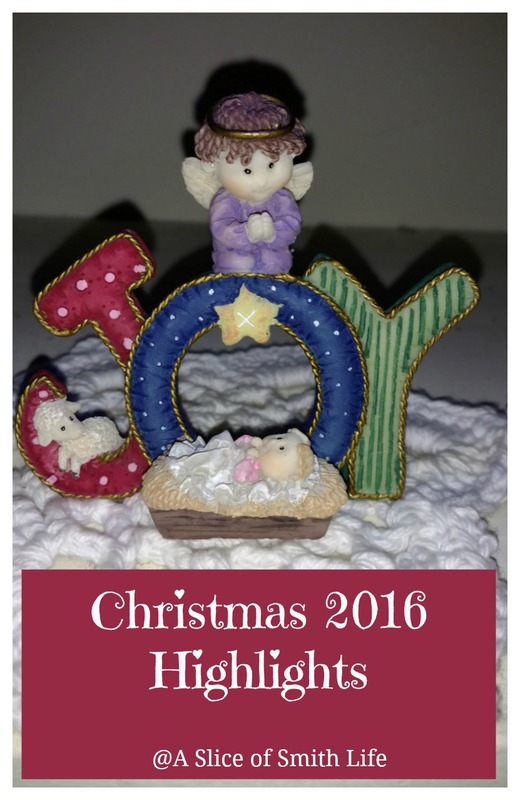 I hope to write a post on my top 10 most popular 2016 blog posts as I look back at another fun year of blogging. 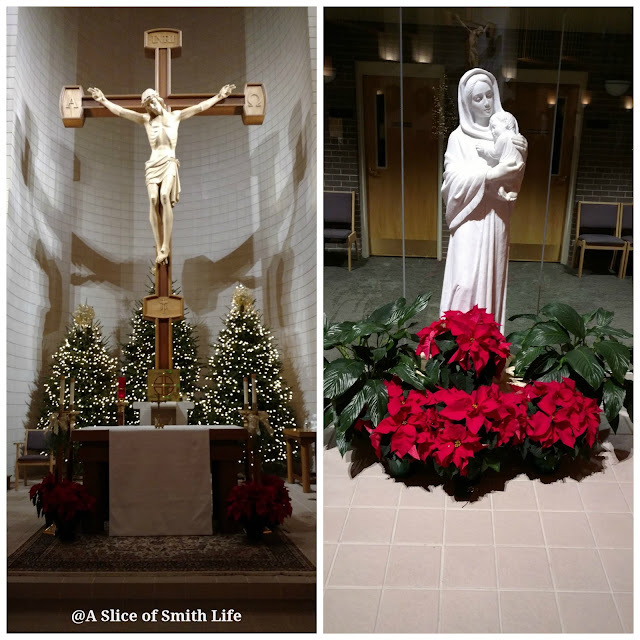 In the mean time, be sure to check out my most popular 2016 post (in case you missed it the first time around), 10 Simple Ways to Celebrate the Canonization of Mother Teresa with Your Family, that I linked up at Catholic Mommy Blogs and be sure to visit the many other bloggers' posts that have their most popular post linked up too! Merry Christmas again and God bless! 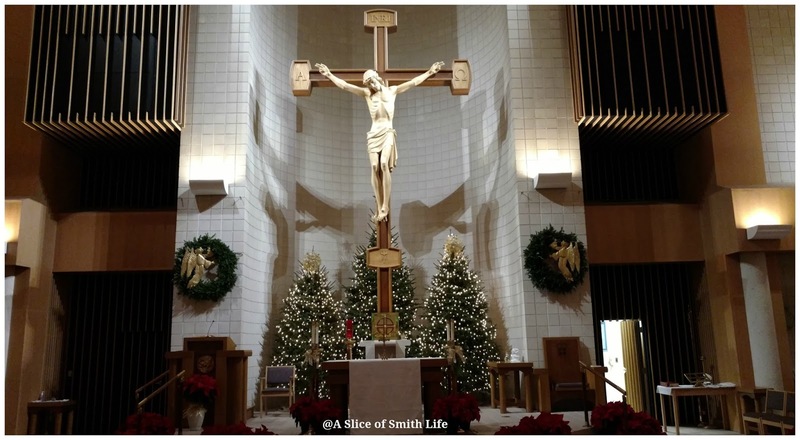 What fun to peruse your post for all the activities, prayers, family events! And oh my goodness, Tracy, I know you're not expecting compliments from your post, but really.....I do not know how you do it all. 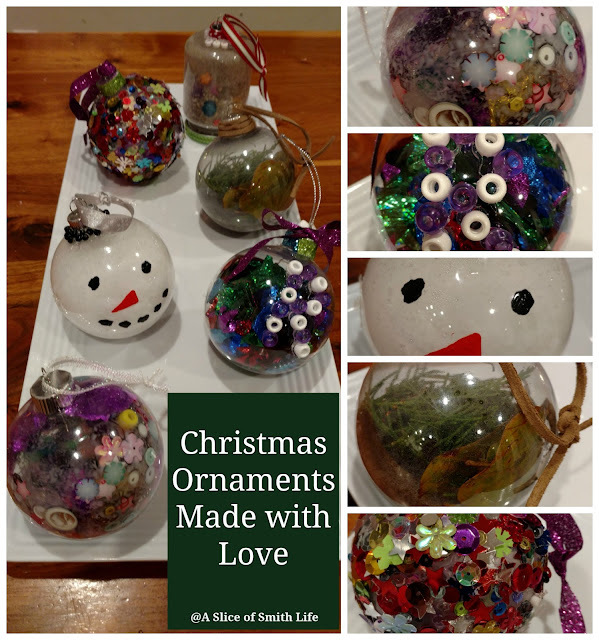 Home made gifts, tree skirt, all those home made ornaments and goodies. Wow. Your children are so blessed. I know they prevaricate all that's done for them/with them too. I just so wish there weren't about a thousand or so miles between us! Good Lord. I meant APPRECIATE . Thank you always for your visits and comments! Your auto correct had me confused for sure! 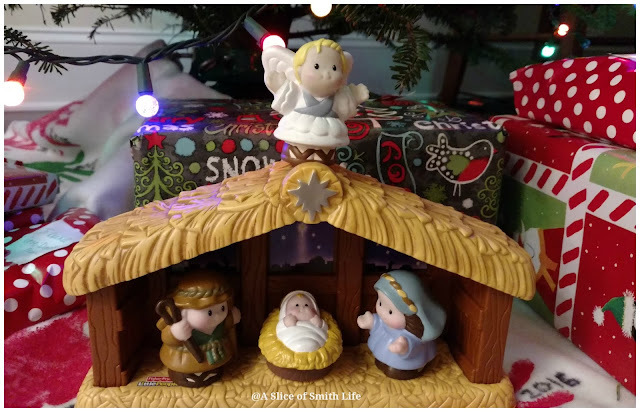 :) It's fun and hectic to do the sweet treats and homemade gifts, but worth it :) I do hope my children will appreciate how we try to live out the liturgical seasons and feast days in the Church. It is my prayer at least (besides us all getting to Heaven together!) I hope you are enjoying your Christmas season Chris! God bless!